Weighty Matters: Silence and blind-faith cripple hope for Canadian nutrition reform. Silence and blind-faith cripple hope for Canadian nutrition reform. Industry always takes the blame for our current toxic food crisis. 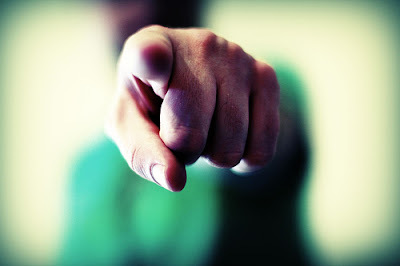 People point fingers and give the evil eye to fast food giants, soda pop makers and the purveyors of junk food, and while I may at times point fingers at them too you'll notice that it's not the products they produce and shill that I'm pointing at, it's the unethical manner in which they market them. Industry doesn't deserve the blame for our current nutritional quagmire, they're just doing what they're in the business to do - sell food. They are not in the business to protect, promote or pander to our health. So who do I think deserves the blame? Maybe you because if you're reading my blog then you clearly care about nutrition and health, and so maybe you because I blame our current nutritional quagmire on the folks whose jobs it is to keep us healthy and educated who despite knowing better prefer to stay silent than to rock the boat. I blame the health professionals who time and time again refuse to speak up against non-evidence based national nutritional policies, the educators who allow school cafeterias to sell foods they themselves teach their students to avoid, the hospital administrators who allow the likes of Burger King and Pizza Hut to set up shop on their main floor or ignore the no-name junk food their own cafeterias excrete, and the regulators, civil servants and politicians who sit idly by while corporations make blatantly false claims about nutrition or weight, or eagerly target our youngest most vulnerable consumers, and yet continue to sell and market their products with impunity. And so if you fit in any of those categories and you stay silent in the face of things you know to be false, or misleading, or non-evidence based, well then I blame you. And why the silence? I can think of multiple possible reasons. Reasons such as fear, profit, laziness, greed, politics, and apathy, but really how do you go to sleep at night if you're letting any of those reasons usurp evidence in the metering of your own public health actions and stands in fields you yourselves purport to care about? The most recent example? Last week the Quebec Coalition on Weight-Related Problems (Coalition Québécoise sur la Problématique du Poids) released a report vilifying front-of-package labeling programs. They rightly condemned Pepsi Co.'s Smart Spot, Kraft's Sensible Solutions and Old Dutch' Snack Wise as being misleading. What front-of-package program did they leave out of their analysis and presentation? Why the most heavily promoted and well known front-of-package program in Canada - the Heart and Stroke Foundation's Health Check. Why did they leave it out? Well on Friday I spoke with the Coalition's Director Suzie Pellerin and she told me they ignored Health Check for two reasons: Firstly because they were only looking at "private" programs and secondly because Health Check is "based on Canada's Food Guide". The Food Guide? Fantastic, it must be great then, right, why even bother looking at the program? I'll tell you why Suzie, you should look at it because the fact is the Heart and Stroke Foundation's name fosters tremendous trust in consumers and if Health Check were in fact built on shaky nutritional foundations it would make it a far more dangerous program than Pepsi Co. and others' where the notion of buyer beware may in fact register among shoppers. On the other hand, if it were a wonderful program, had you actually evaluated it you could have used it as contrast to show how woefully deficient the industry's programs are when compared to a "based on Canada's Food Guide" approach. Truth be told, Health Check is abominable. It's a front-of-package labeling program that grants its heavily trusted, and even more heavily promoted, seal of approval to lowest common denominator processed foods. Health Check allows participating products to contain up to 5% trans fat, milk to be sweetened with so much sugar that it contains double the calories and sugar of Coca Cola, the provision of more than a third a child's daily sodium allotment in a single item, and it puts no limits on juice consumption, doesn't differentiate between whole grains and refined, ignores the concept of calories and it is complicit in the sale of highly processed foods to children using Disney cartoon characters. Health Check is also a program that the Center for Science in the Public Interest, and even Chatelaine magazine, had no difficulty in lumping together with the "private" logos and one which CBC's Investigative Consumer Show Marketplace has skewered mercilessly regarding its nutritional deficiencies on two occasions. And truth be told, Suzie and the Coalition knew all about these non-defensible issues with Health Check as I know they regularly read my blog, and frankly even if they didn't, their initial survey was done by dietitians who certainly have the means with which to critically evaluate Health Check's lacking nutritional criteria. So why do I think they didn't speak up? Silence and/or blind faith. Wilful silence because perhaps they felt they couldn't afford to upset the Heart and Stroke Foundation, one of the Coalition's partners, and perhaps for those Coalition members who don't read my blog, blind faith in that the Heart and Stroke Foundation, like Canada's Food Guide is blindly considered by many to be sacrosanct and beyond reproach. Sadly, it's not just the Coalition. Where are the voices from the Canadian Diabetes Association in denouncing the Food Guide for not ensuring that its call to action on diabetes-inducing refined grains is to minimize their consumption while maximizing diabetes preventing whole? Where are the voices from the Canadian Cancer Society in calling for a revision of the Food Guide's meat recommendations to be consistent both with our currently available scientific literature and their own call to keep red meat consumption to a weekly maximum of 255grams and to virtually avoid all processed meats? Where are the voices from the Canadian Medical Association and the Dietitians of Canada in opposing a Food Guide that calls only for "limiting" rather than avoiding trans-fats, that includes chocolate milk as a food children should consume more of and that fails to provide practical guidance on calories or sodium choosing instead to provide feckless, duh-inspiring, "choose less" recommendations? Why aren't all of the folks above standing on the rafters of the House of Commons and demanding the establishment and implementation of evidence-based nutrition in our schools via the development of a national school food program, or championing the protection of Canadian consumers from overly liberal allowances to market foods and nutraceuticals as beneficial to health in the absence of rigorous proof? It's time we stop turning a blind eye to the things we know are wrong. Diet and weight related illness are killing tens of thousands of Canadians each and every year and will ultimately cripple our health care system. It's gone far past growing a set of proverbial balls, now it's about listening to consciences that should be appalled at silence's fatal consequences. It's important too to point out that I'm not talking here about esoteric, unimportant nutritional minutia, I'm not talking about what I believe versus what you believe, I'm talking about a robust evidence base, I'm talking about the lives of our friends and families and I'm talking about the future of Canadian healthcare as we know it. If you're already fighting the good fight - thank you. If not, it's time you take a stand. Either way, if you work for a public health agency, a medical NGO, or a nutritional organization, pass this post around and for god's sake, stop accepting policies, programs and positions that make a mockery of the causes you yourselves purport to be championing. If after reading this you're ready to fight but stuck for causes to champion stay tuned tomorrow when I go over ten nutritional hills worth dying on.